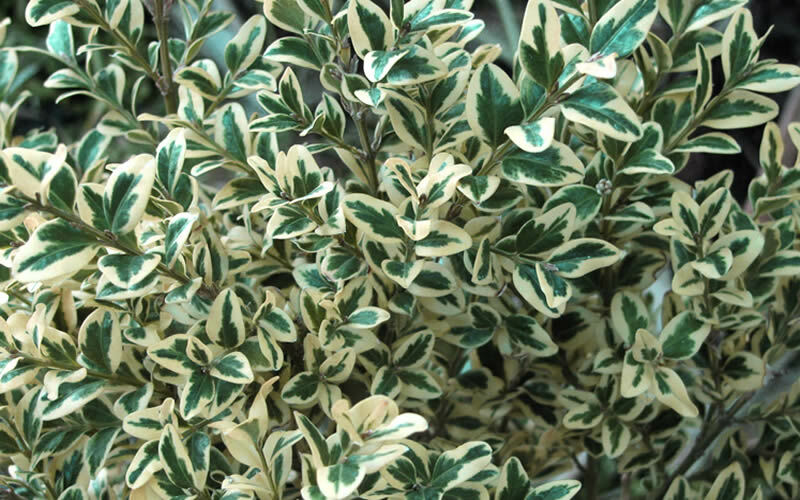 An eye catching dwarf evergreen shrub that will light up your landscape or container gardens, the Dwarf Variegated Boxwood sports outstanding variegated leaves of white, yellow, medium green and dark green. Get all the details below! Note: For our customers who live and garden north of USDA Plant Hardiness Zones 6a, where this Boxwood variety is not reliably winter hardy, you'll be happy to know it can be grown in containers that can be brought indoors during winter and placed back outside when temperatures warm up in spring. 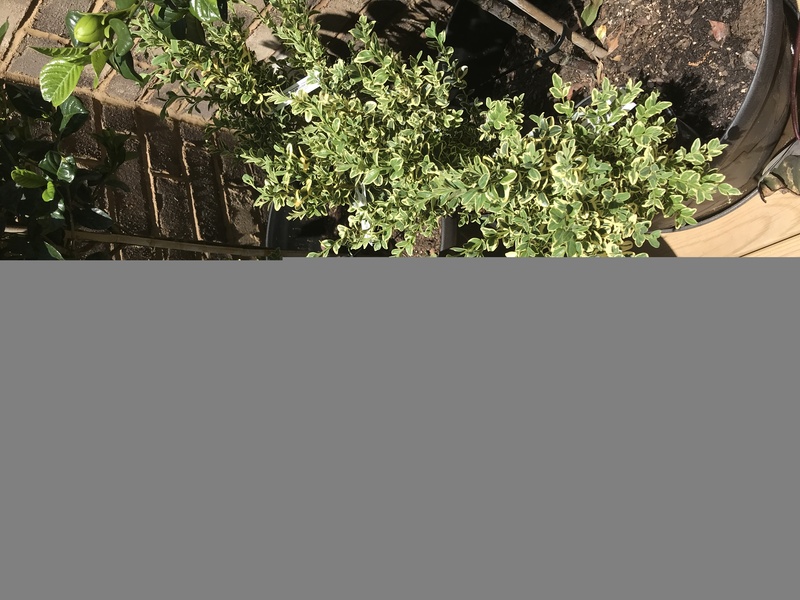 An eye catching dwarf evergreen shrub that will light up your landscape or container gardens, the Dwarf Variegated Boxwood sports outstanding variegated leaves of white, yellow, medium green and dark green. 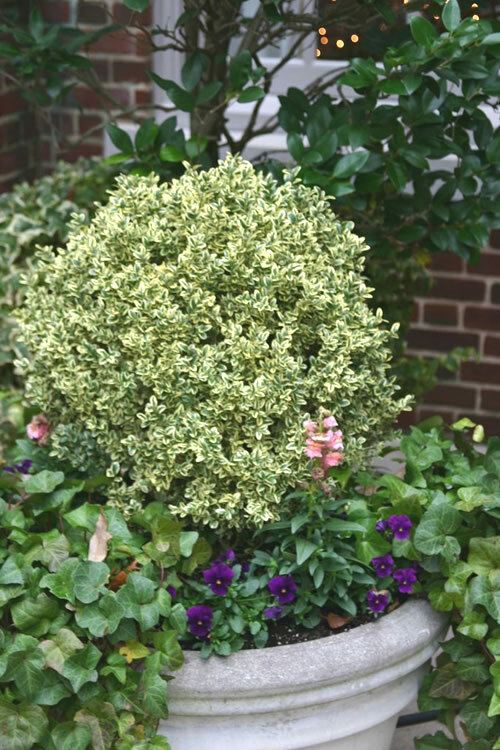 This cute little boxwood provides excellent contrast and/or a splash of color just about anywhere in the landscape that gets 3 hours or more of direct sun, maintaining its bright color even in more shady areas. 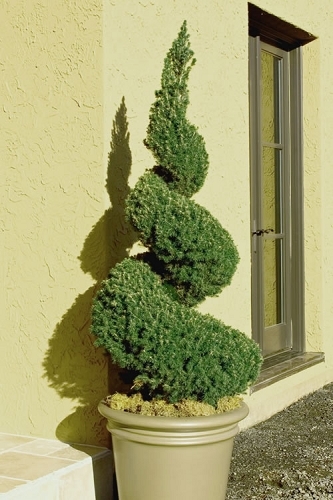 No pruning necessary however can be sheared to formal shapes. 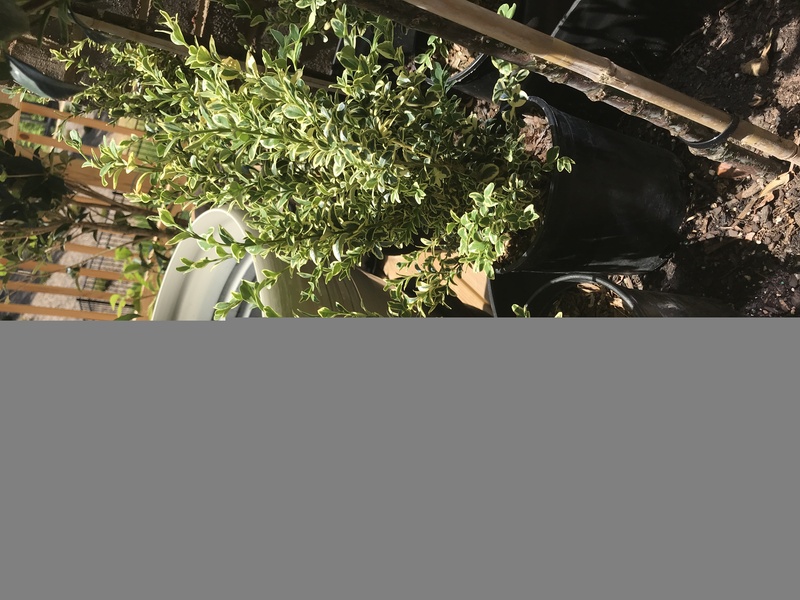 Growing in a rounded form 18 to 36 inches tall and wide (depending on pruning), the Dwarf Variegated Boxwood is a bright accent in smaller garden spaces and perfect for use in pots, planters and other containers 12 inches or more in diameter. Also ideal for use as a colorful natural or clipped formal low hedge or as a specimen or grouping in landscape borders or home foundation plantings. 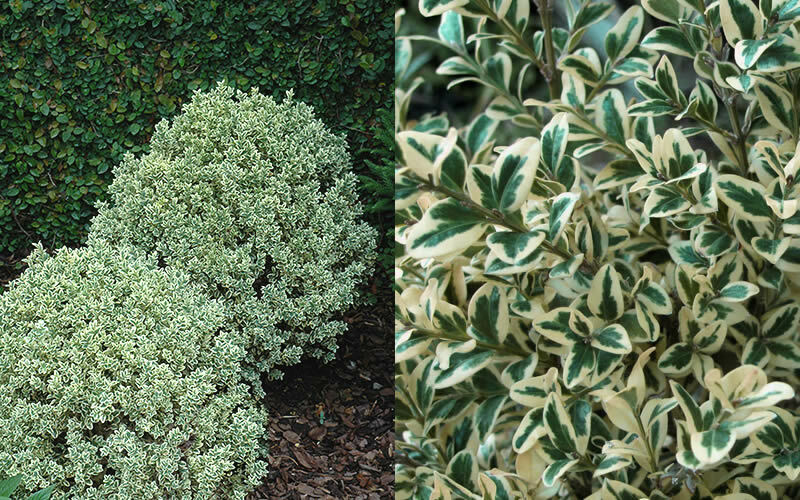 The Variegated Dwarf Boxwood is easy to grow when planted right, and in the right spot. It adapts to most soil types and likes full sun or part shade, preferring afternoon shade or filtered sun in warmer climates of the South. It prefers a moist but well-drained soil and will only need supplemental water during prolonged periods of dry weather. As with many other plants, a constantly soggy or wet soil can be problematic. My Dwarf Variegated Boxwood arrived healthy and ready to plant. I will order again. 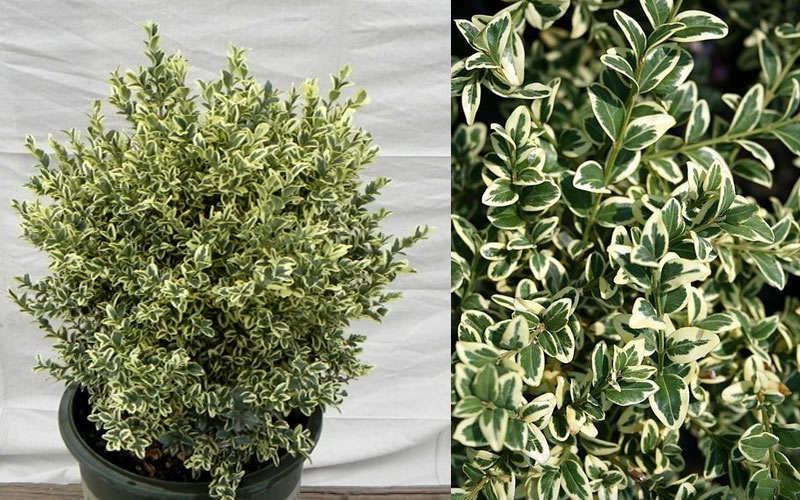 Q: Would the Dwarf Variegated Boxwood grow in an area with afternoon shade in USDA Zone 9b? 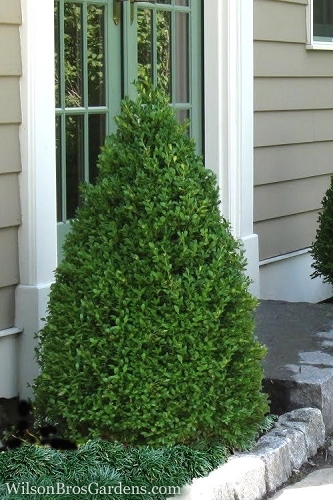 The Dwarf variegated Boxwood is listed as hardy in 6a-8b. I think it might be too hot there in Zone 9b...though in afternoon shade, where temps are 10 to 15 degrees cooler than in sun, it might survive. That said, I would test one out for a year or so before buying a number of them. You might consider the Sunburst Golden Variegated Korean Boxwood, Baby Gem Boxwood or Sunshine Ligustrum. which are listed hardy for zone 9b and are small dwarf shrubs with small leaves and all respond well to shearing. Let us know if you need more details or have any other questions. Q: I see differing mature height and spread averages for variegated boxwoods. They range from 2' - 3' to 6' - 8'. Does this plant truly max out at 2' - 3'? Does it grown in a mound or pyramidal shape? I see some that say they grow as a mound and some that say pyramidal. Help! 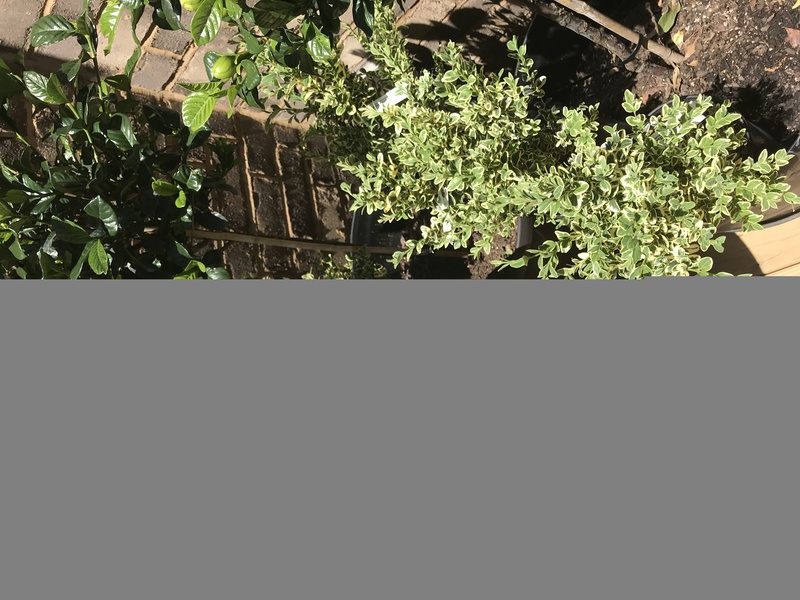 The Buxus sempervirens 'Nana Variegata' is a dense, upright, rounded form. I have one in my landscape now for about 5 years and can say it is very slow-growing variety that adds maybe 2 to 3 inches per year and is more upright and rounded than mounded. 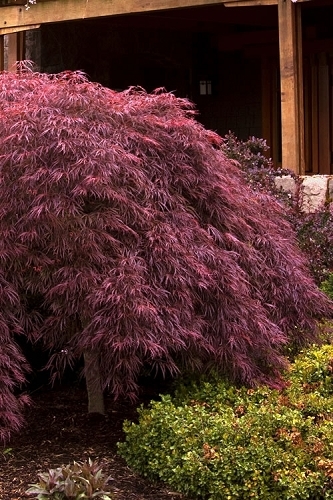 We've listed it at 2-3 feet height depending on pruning, because it could take 10 to 15 years or more to obtain that height from a 10-12 inch tall starter plant. 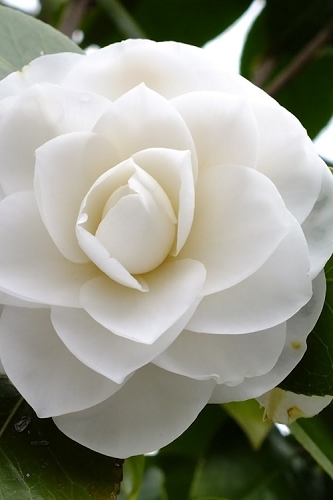 Over many years time the plant might reach 4 to 5 feet height if left to grow naturally with no pruning. We've changed our height range to reflect this. I give mine a light annual pruning in late winter just clip off a few branch tips that have grown a little longer. Let us know if you need more details or have any other questions. We're at your service! Q: I would like to buy boxwoods small enough for my window boxes. What size pot and variety would you recommend if I put 3 in each planter. The smallest growing boxwood we carry is the Grace Hendrick Phillips Dwarf Boxwood. It is also slow-growing which makes it the most suitable for growing in window boxes. To find it on Wilson Bros Gardens, just type Grace Hendrick in the search at the top of any page in Wilson Bros Gardens. That said, if you like the foliage of variegated dwarf boxwood better it's also a slow grower a good candidate for window boxes, though it might require more frequent pruning over time to keep it smaller. Both of these boxwoods come in a trade gallon (6" pot) so should fit the width of most average size window boxes. If you want three in each window box, and you want them to eventually for a hedge, I would suggest equal spacing in a 24" long window box. If you want the individual look with space between each plant then maybe a 30 to 36" long box. That way you could plant ivy or some other trailing groundcover plant between the boxwoods. Let us know if you need more details or have any other questions. you are going to keep it in the pot and are 7a or below , I would say to keep it indoors in a sunny window for the winter...or at least bring it indoors when temps are gonna drop below 25 degrees or so. 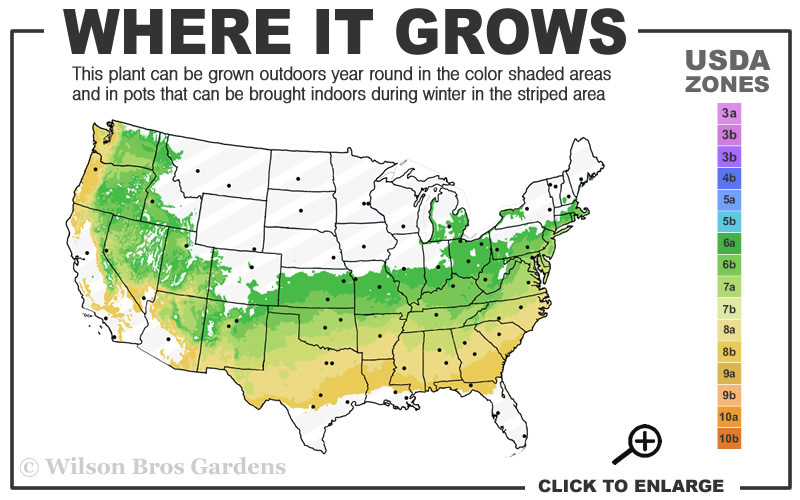 If your location is USDA zone 7b or above it would be OK to keep it outside. Q: What is the meaning of trade gallon size six inch pots? Am I getting one plant per six inch pot for $30? I'll answer your second question first. Yes, when you order the trade gallon - 6" pot size you get one plant for the listed price. 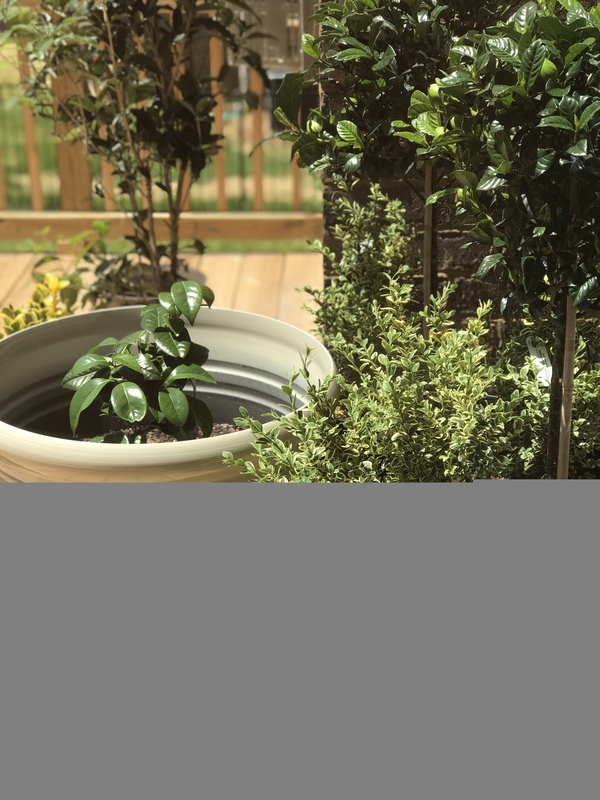 The Dwarf Variegated Boxwood is slow to grow so this is why it costs more than many other types of plants that are growing in the same size pot. To answer your first question. For years growers only grew plants in "full gallon" pots. Then, not too many years ago, along came the "trade gallon" pot, which plant growers use for several reasons: some plants grow better in a slightly smaller pot, and it saves the grower a little on soil media and space. Some nurseries don't distinguish between the two sizes, they just call them both "1 gallon pots." But we want our customers to know that there is a small size difference. The full gallon is 7-inch diameter whereas the trade gallon is 6-inch in diameter. We just don't want there to be any confusion. The size of these two pots really doesn't make much of a difference though in the size of the plant. Sometimes, a specific type of plant in a trade gallon is the same or larger size than plants in a full gallon pot. It really just depends on how long the plant has been growing in the pot. Hope this info was helpful and let us know if you have any other questions. 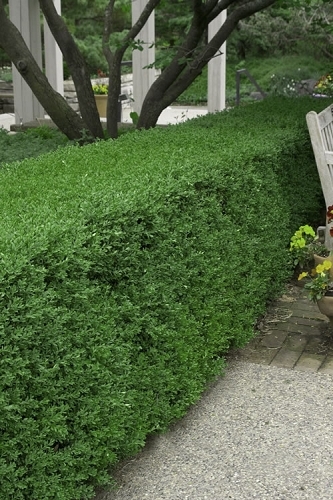 Click on a link below to gfind helpful advice from our experts on how to plant and care for Boxwood shrubs.